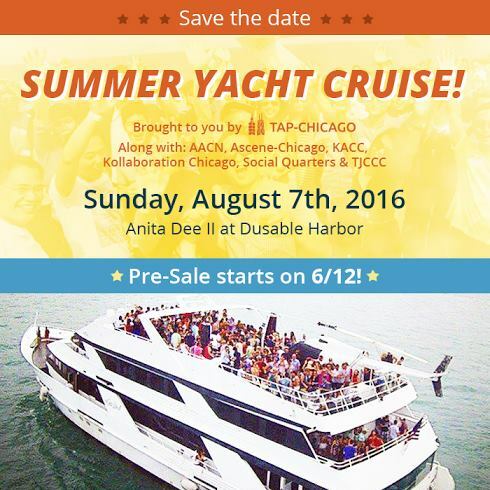 Taiwanese American Professionals – Chicago (TAP-Chicago) proudly presents Summer Yacht Cruise 2016 with AACN, Ascene Chicago, KAC-Chicago, Kollaboration Chicago, Social Quarters, and TJCCC. For the 3rd year straight year, the Asian American professional community is coming together on the Anita Dee II for the biggest networking event of the summer. Mark your calendars for August 7th, this is the one event you won’t want to miss!! Newly renovated sun deck with more open space, and newly installed full service cash bar. Get your tickets now as PRE-SALE & EARLY BIRD are in limited supply and will be gone fast! All sales are final. Refunds are not allowed, but ticket transfers will be permitted.